Size: -- Choose Size -- 1-1/2" 2" 3" 4"
The NIBCO 4807 90-degree elbow pipe fitting is made of PVC for drain, waste, and vent systems (DWV) and has hub connections. This 90-degree elbow fitting, or "ell," connects two pipes at a 90-degree angle to change the direction of flow between pipes. It has female hub openings for sliding over the ends of male pipes. The hub end connects to pipes with a smooth bore for enhanced flow. 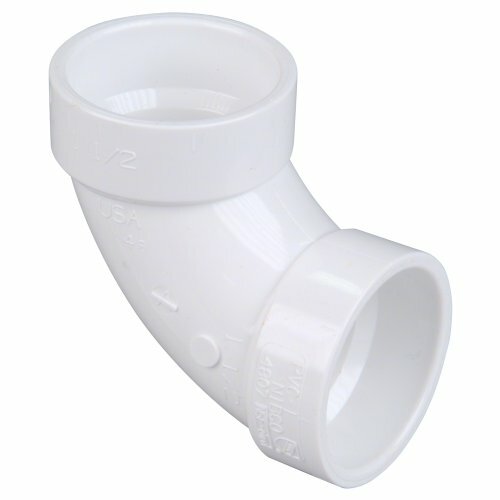 This fitting is made of PVC for use in non-pressure residential and commercial drain, waste, and vent (DWV) sanitary systems. PVC resists corrosion and chemicals, exhibits high strength, and weighs less than fittings made from metal. PVC can be connected to other materials such as steel, copper, or cast iron using transition fittings. This fitting provides superior flow to metal because of its smooth interior finish, which reduces friction and inhibits buildup of materials. This fitting meets American Society for Testing and Materials (ASTM) D2665 and D3311 specifications for quality assurance.